An area nearly as large as Europe offers you a unique travel: Tahiti, Bora Bora, Marquesas and other hidden Paradises are waiting for you. The edge of the world… No other destination deserves this term better than Tahiti Islands. Located nearly 2,500 miles (4,000km) from land, her 118 islands are sheltered from mass tourism. This isolation may seem to be a disadvantage but it is actually an incredible asset for those looking for a different type of trip in a protected and privileged environment. French Polynesia can be described at length as a place of outstanding beauty boasting incredible lagoons, mountainous landscapes and colorful marine wildlife. Tahiti can be compared to any other dream destinations such as the Seychelles or the Maldives, but no other place allows you to feel so completely immerged in an authentic culture of well-being and friendliness. Incredibly this feeling carries through into the luxury resorts as well as in the small and simple family hotels. At a time where huge hotel projects are being built in some of the best locations worldwide, French Polynesia is proud to have been able to maintain its exclusivity with a limited number of hotels and a range of high quality B&Bs. Swimming with dolphins, sharks and rays! Take the time to discover these islands and understand why they are so magical and charming. The most populated group of islands comprising of the famous Bora Bora, Moorea, Huahine, Raiatea, Tahaa and of course, Tahiti. 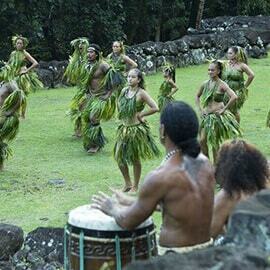 Between lagoons and mountains, enjoy many water and land based activities whilst discovering the Polynesian culture. 78 atolls make up this group of islands. An atoll is a ring of volcanic and coral land resulting from a volcano landslide. The main atolls are located about 1 hour flight from Tahiti. These strings of islands (some wide and some just a few hundred yards wide!) form a ring surrounding a magnificent lagoon. The largest atolls are Rangiroa, Fakarava, Tikehau and Manihi stretching on for many, many miles. Atolls are ideal spots for world class diving or just visiting by boat ensures a vision of outstanding beauty with clear blue lagoons. These 10 Marquesan islands do not host a coral reef and their unusually steep mountains drop_dramatically into the ocean. Travelers will particularly appreciate the population’s friendly greeting and the rural atmosphere which seduced famous artists (Gauguin and Brel). Discover Nuku Hiva and Hiva Oa’s magnificent valleys on either a 4WD tour, horse riding or hiking. Located further south, the Australs feature a cooler type of weather. Stopping in Rurutu, Tubuai or Raivavae will be a true delight. These places are heaven on Earth and are perfect for whale watching, kite boarding, discovering ancestral people or simply relaxing! Around Mangareva, 4 other islands and 18 “motu” islets meet within a unique lagoon offering paradise like sceneries. 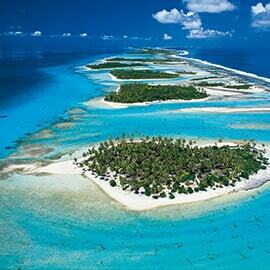 Located at the extreme south-east of French Polynesia, these islands are away from the usual tourist tracks. Our advisors will, however, work on quality itineraries for travelers in quest of a different type of trip. The islands are rich in spirituality boasting a mainly Catholic population and a place where religion sets the rhythm of life and is the cause of many celebrations!